Moog continued to market his modular systems after his first orders at the AES convention of 1964. With transistors enabling small, portable devices, he was able to sell component systems consisting of oscillators, amplifiers, noise generators, and filters. The components could be interconnected by patch cables to create a variety of sounds limited primarily by the number of available modules and the synthesist's imagination. In 1967, he began calling it a synthesizer, apparently realizing it had much in common with the RCA synthesizer at Columbia-Princeton. The voltage controlled modular synthesizer was based in subtractive synthesis, which involves the use of complex waves or noise and filters. Click here for an example of a patch that could be created on a voltage controlled modular synthesizer. While Moog synthesizers were to become the most famous, they were not the only modular synthesizers to be created at this time. By 1965, the composers at the San Francisco Tape Music Center were tiring of the endless splicing work involved with producing tapes. So Don Buchla created an automation system with voltage controlled modular components. It featured a sequencer, which could store a series of voltage values. These could then be applied to a number of musical parameters, such as pitches, volume levels, or filter cutoff frequencies. It was in some ways an electronic player piano. Besides the sequencer module, another principal difference between Buchla's and Moog's instrument was that Buchla's was not based on a clavier keyboard. His instruments featured a series of capacitance plates. Pressing on the plates changed their capacitance, and their changing voltage levels could be directed to different musical parameters. As the Moog and Buchla companies refined their products, different controllers besides keyboards were developed for these instruments. A sequencer was not only part of the Buchla system. The Moog company was also manufacturing them by 1965. A ribbon controller sent voltage changes according to where a horizontal ribbon was depressed with a finger. This is reminiscent of the ondes martenot. The output could be patched to the input of any module, allowing the creation of a smooth change in pitch (VCO), timbre (VCF) or volume (VCA). An X-Y controller was a joystick, a device adapted from radio controlled model airplanes. Its horizontal and vertical positions were separate outputs that could be patched into different modules. A drum produced a gated signal when the drum was hit (one with definite start and stop times), so that a VCO could be triggered by a percussion instrument. A touch-sensitive plate featured a square that was pressed with a finger. It had four outputs that tracked proximity to the four sides, plus an output that varied with pressure, and another that varied with the surface area depressed. A sample-and-hold unit produced a random voltage value periodically. This could be sent into any other module for a constantly changing output. A tape deck controller allowed the output of a VCO to control the speed of a tape deck. It was particularly effective with low frequency sine waves. An envelope follower had an audio input, and it produced voltage changes in proportion to the audio input. So a signal from a microphone could be patched to a VCA, VCO or a VCF. The team of Paul Beaver and Bernie Krause brought the "Moog sound" to the Los Angeles societies of popular music and Hollywood. Their work is heard on a number of signature early synthesizer recordings. 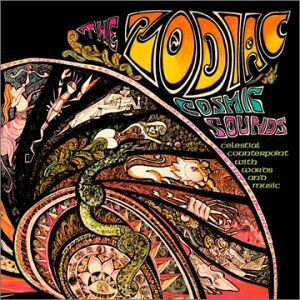 Among them are the album Cosmic Sounds an assemblage of music arranged by Mort Garson, poetry, and electronic effects. It remains a hallmark of the psychedelic era, right down to its liner instructions: "MUST BE PLAYED IN THE DARK." 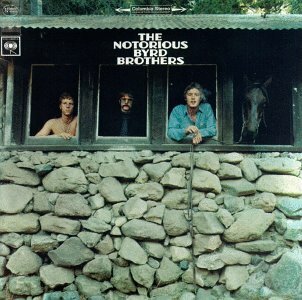 This, plus the Byrds' The Notorious Byrd Brothers, put Beaver and Krause in the right place at the right time. They became the West Coast representatives of the Moog company at a time when psychedelic rock music was beginning to look like big business to the record companies. Following these recordings, they set up a performance/demo at the Monterey Pop Festival of 1967. This was the first meeting of a number of rock streams, from San Francisco hippies to rockers from New York and London, many of them running around with large advances they'd recently received from record companies. Once they heard they Moog, they placed orders. The psychedelic era represented a culture of breaking down boundaries and new transformations. The synthesizer, with its ability to create new sounds and shape them in ways never heard before, was an ideal tool not just for music, but as part of the overall goal of reshaping consciousness. 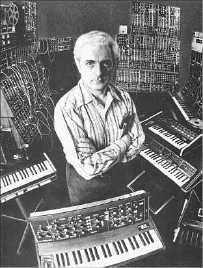 The first all-synthesizer album was created by Morton Subotnick (1933-) with the Buchla system. Subotnick had been one of the composers at the San Francisco Tape Music Center, and was now teaching at New York University and had brought his Buchla with him. Called Silver Apples of the Moon, it represented a rather bold step by Nonesuch Records. It sold in classical music sections, and was quite popular when it came out. Both Subotnick and Nonesuch were taken with the idea of creating music that was to be played in people's living rooms over their stereo systems. The album's release signified the ubiquitous presence that audio equipment had assumed in the American home. The title was from a poem by W.B. Yeats ("The Song of Wandering Aengus"), and was meant to transport listeners to a variety of sonic landscapes, sometimes with no transition. It was characterized by prominent use of the Buchla sequencer to create quick filigrees of notes. Subnotnick's next effort was The Wild Bull, released in 1968. This piece was based on a Sumerian poem, narrated by a woman who was lamenting the death of her husband in a war. It began with the text "The wild bull who was lying down..." Subotnick attempted to create a piece about war and loss. This piece was also characterized by the sequencer, but in a manner a bit more understated than on Silver Apples of the Moon. Some of the effects are obtained by applying the sequencer to filter cutoff frequencies, rather than pitches, so that timbral changes were looped. The piece also has as a prominent element a descending low tone, meant to suggest a moan of lament. It has a lower, heavier sound overall, to suggest a sense of antiquity and loss, the timelessness of mourning early deaths. 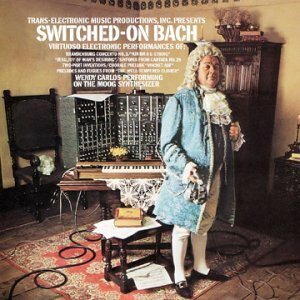 The big commercial breakthrough came with Switched-On Bach, by Wendy Carlos (1939-), in 1968. Carlos had done graduate work at Columbia with Ussachevsky and Luening, worked as a recording engineer after graduating, and had become friendly with Bob Moog as she explored and helped develop the modular synthesizer. This album was the result of countless hours of painstaking studio work. Synthesizers at the time were monophonic. For legato passages, where notes overlapped, the parts had to be recorded one note at a time, on separate tracks of a multitrack tape deck, with successive notes alternating between two tracks. The pieces had to be thought through before they were recorded. To give them life, a click track would have to be recorded that incorporated slight changes in tempo. This was achieved with a single pitch being controlled by a low frequency oscillator. The frequency of the LFO was controlled by the keyboard, with lower notes to slowing it down and higher notes speeding it up. She recalled in a 1979 interview that the difficulty in working with the click track was first learning to play to it, and then learning to take that a step further and not play right on the beat, but "around" the beat. Frequently, each successive note in a passage had a different envelope assigned to it, such as alternating between quick, "percussive" attacks and slow attacks, in emulation of a string player changing bowing directions for each note. Thus, the album featured an obsessive attention to detail down to every note, timbre, articulation and rhythm. Among the album's admirers was classical pianist Glenn Gould. By the 1960s, Gould had retired from performing and devoted himself to studio recordings. His absence from the public was partly due to his searching for ideal performances of a work, often obtained by splicing passages of different performances together. Another was due to his discomfort with his perceptions of the politics of the concert hall, with the performer separate from the audience, a situation that he felt hindered the purity of the musical experience for the audience. Gould reportedly admired Carlos' clarity of the various parts in the works. Passages that were important musically were highlighted by Carlos' attention to timbre and other details. She was later to describe the process as being analogous to the way early Disney cartoons were created, with one frame drawn at a time. The efforts were not in vain. The album won a Grammy award and became the first classical recording ever to go platinum. It brought the synthesizer into popular consciousness, with features appearing in The New York Times and Newsweek. Carlos became the superstar of the electronic music movement. The synthesizer became the musical flavor of the month. Dozens of "Switched-On" albums were released consisting of tongue-in-cheek renditions of music in all genres. Many of these albums are now collector's items of period kitsch, notable probably more for their cover art than for the music they contain. Sales came nowhere near those of the Carlos albums. Shortly after the release of Switched on Bach, the band Emerson, Lake & Palmer released the song "Lucky Man." It featured a synthesizer solo by Keith Emerson, played on a Moog, featuring dramatic pitch bends. This knocked the socks off rock and roll listeners. Synthesizers gradually moved from being arcane technical puzzles to something any self-respecting keyboardist had to have. A number of composers began to explore the use of synthesizers and sequencers as composition/improvisation tools. Larry Austin used a Buchla system and controlled its sequencers with the touch pads, so that by interacting with the machine he could control the rate of sequencing. Some sequencers triggered other sequencers, so that all of the processes could interact with each other. The prize for largest collection of Moog sequencers went to Joel Chadabe (1938-), who worked with Bob Moog to create an automated synthesizer system called CEMS (Coordinated Electronic Music Studio) from 1967-1969. It had a large array of sound generating modules, as well as a digital clock and eight sequencers that could be run synchronously, asynchronously, one after the other, or in any combination. Chadabe used the system to create processes with varying degrees of determinacy and randomness so that compositions could be realized as the system played. 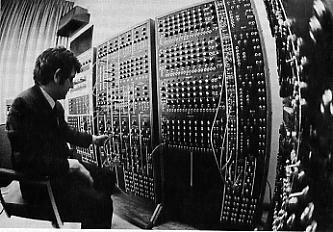 The fortunes of the Moog company took a downturn after the initial Switched-On Bach rush. At the same time, engineers and consultants were finding that they used the same patch configurations time and time again. The company began to design a smaller instrument, more suitable for mass production. In 1969 the Minimoog was released. This was a smaller, more portable synthesizer on which connections between modules were made at the push of a button, rather than via patch cables. While not as flexible as the large modular systems, it could be sold in retail stores and was practical for stage use. With its handsome walnut case and flip-up control panel, it was much more an instrument than an electronic monstrosity. As the first affordable and portable synthesizer, it was featured on many rock recordings in the 1970s. It was largely responsible for "democratizing" the synthesizer. The patching was all internal, consisting of a few basic configurations, eliminating the "spaghetti factor." It featured two expression controllers, the pitch bend wheel and the modulation wheel, which controlled vibrato. These two expression wheels became standard features on synthesizer instruments (and remain so to this day). In 1969 the ARP synthesizer company was launched, and the synthesizer industry was born with competing companies and products competing for the highest "cool" rating. In London the VCS synthesizer was used by artists such as Pink Floyd and Brian Eno, and was sold briefly in the United States as the Putney. Along with the industry came a new focus in keyboard circles not just of traditional playing techniques, but attention to timbre. Gear magazines such as Keyboard and Electronic Musician appeared by the end of the 1970s. Musicians could soon become one-person bands with the aid of synthesizers, sequencers, and drum machines into which rhythmic patterns could be programmed. Perhaps the most unusual and difficult to maintain instrument was the Mellotron, which offered an alternative to synthesizers by featuring lengths of recorded tape of different instruments. Each length of tape lasted approximately eight seconds, and each was assigned to a different key, thus producing a recording of an instrument at the pitch of the depressed key. The tapes did not loop, so the duration per note was limited to the length of tape. Mellotron tapes were often three-track, enabling sounds to be changed on the fly via a switch that shifted the playback heads. This was popular for a number of years with rock bands that could afford to maintain and/or transport the instrument. Perhaps the most famous recordings are the flutes that are featured in the introductions of the Beatles' "Strawberry Fields Forever" and Led Zeppelin's "Stairway to Heaven." Carlos continued to release synthesized classical music, and gained further exposure with the soundtrack to Stanley Kubrick's film A Clockwork Orange, in which the electronic musical score reflected the disturbing futuristic setting of the film. The soundtrack featured both realizations of classical works and original compositions. Among the disturbing elements for many viewers was the use of the vocoder for singing synthesizer effects. This was the first time the device had been used in a music recording, and many listeners did not know what to make of it. This was just one disturbing aspect of the film that was also shocking for its portrayal of sexuality and aggression. In 1973 the film was pulled from British cinemas due to allegations that young people were copying the violence they'd seen in it. Today the film is considered a classic, although well deserving of its R rating. Trevor Pinch and Frank Trocco, Analog Days, Harvard University Press, 2002.